FBI counterterrorism chief Dale Watson said Wednesday he believes Osama bin Laden is dead — the first time a senior U.S. law enforcement official has publicly given an opinion on the al Qaeda leader's status. Watson, speaking at a conference of law enforcement officials at a downtown hotel, quickly emphasized that he had no evidence that bin Laden was dead, but his comments suggest that the FBI has no intelligence that proves bin Laden is alive. "Is (bin Laden) alive or is he dead?" Watson said. "I am not really sure of the answer ... I personally think he is probably not with us anymore but I have no evidence to support that." Watson also said that bin Laden's network of terrorist training camps has been dismantled, but "there is no question in my mind ... we will be attacked again." Watson, who rarely makes public appearances, is the top official for counterterrorism and counterintelligence in the FBI. He did not elaborate on his comments on bin Laden and rushed away from reporters after he spoke. CBS News Correspondent Jim Stewart reports speculation over bin Laden intensified in recent weeks largely because of items in the Arab press. One report claimed knowledge that bin Laden was wounded in the shoulder during fighting at his Tora Bora hideout early this year and was treated at a Pakistani hospital. 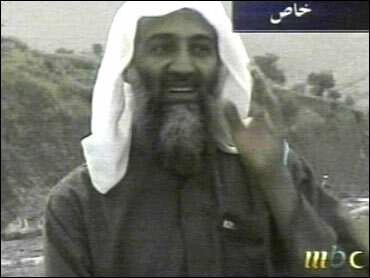 Another report speculated bin Laden died in the fighting. In June, Abu Gaith, bin Laden's spokesman, released an audiotape to an Arab television outlet. He also claimed that "Sheikh Osama Bin Laden is in good health, and those in command of al Qaeda are still carrying out their responsibilities." Adding to the speculation is the fact that it's been several months since bin Laden has been seen, and with each taped appearance his health and appearance seemed to deteriorate. The FBI has obtained samples of bin Laden's DNA and last month were checking it against tissue and body parts, including a skull, recovered from Afghan battlefields. The skull, however, turned out to belong to a woman. Privately, officials can't understand why bin Laden, if he is alive, hasn't surfaced to thumb his nose at the U.S. The al Qaeda response to that is that bin Laden is just being patient and awaiting the results of the next attack on America.